Animals adopted from the Houston SPCA helping students! 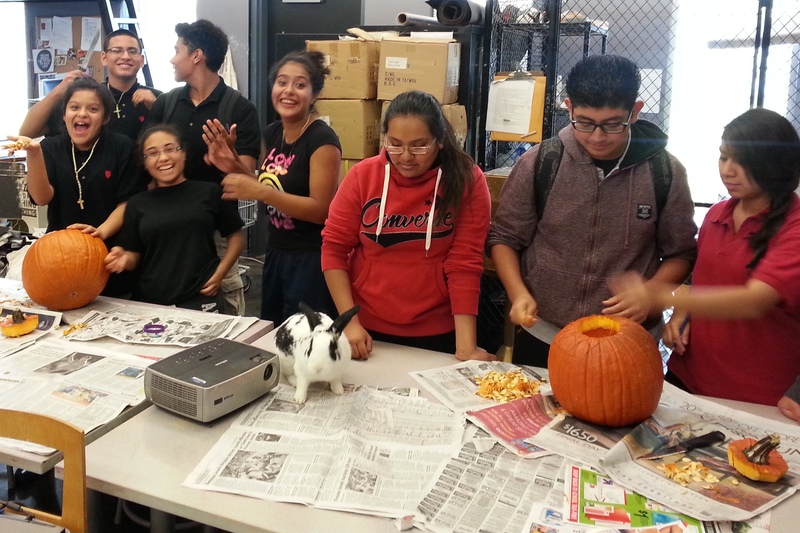 We just received an update from the KIPP Houston High School Art School about their recently added staff member to their faculty – an adorable bunny rabbit named Mr. Adams! Mr. Adams was adopted from the Houston SPCA about a year ago to help the students learn about caring for animals responsibly and to have a fun friend in the classroom. “Mr. Adams has become a leader at school. He was captain of Onyx (because he has black spots) to earn points at the pumpkin carving contest for his team. Although, some teams were suspicious of his intentions (he started the “carving” early this morning while the pumpkins were on the floor). As you can see, this bunny is beyond spoiled. He gets fresh veggies every day from staff and students and tons of freedom and love. 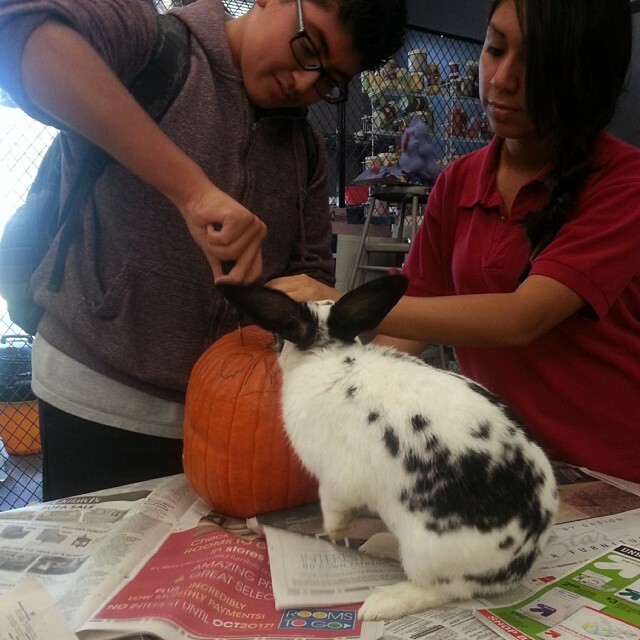 Now, several students want to adopt a bunny and avoid breeders because there are so many unwanted animals at SPCA. We absolutely love that this classroom has decided to choose the adoption option for a class pet. Having a class pet can help students focus on their studies, open up to someone about issues they may not be comfortable talking about with teachers or friends, and just be there to be a friend when you need it. If you or a teacher you know wants to adopt a pet for their classroom, you can always check out the Houston SPCA to see if we have a furry friend for your students! Thank you KIPP Houston High School for choosing the Houston SPCA! Categories: Houston SPCA, Rabbit, School Programs, Schools | Tags: Adoption Option, Class Pet, Houston SPCA, KIPP, KIPP Houston High School, Rabbit | Permalink.